Yolanda Wreck, Ras Mohammad, Egypt, originally uploaded by Craig Grobler. 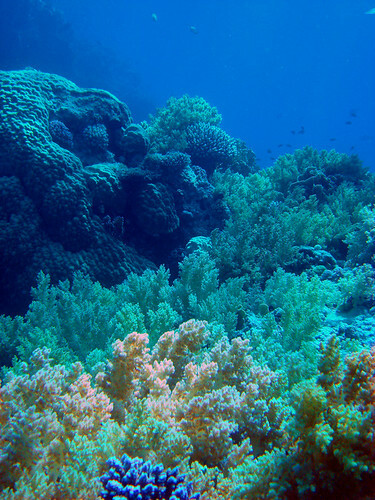 Sharm boasts excellent diving facilities with vibrant coral and fish life. Sharks are sometimes spotted. Many varied reef systems to explore from dayboats. Excellent Dive Sites include Shark and Yolanda reefs: These two reefs are connected by a sandy plateau where you'll find the shipwrecked 'Yolanda'. You can drift along the natural currents provided by the Red Sea, explore the Yolanda wreck, or gaze at the colourful coral along the reef. At shark reef you can expect to find large fish and of course sharks. You'll also encounter rays, turtles, large eels, and large schools of fish swimming by. It's a magnificent site, and one that divers never forget. The Jolanda (note correct spelling - it is very often wrongly spelt Yolanda) was owned by the Sea Brother Marine Shipping company. She was a Cypriot merchant ship, 72 metres in length. The Jolanda was on a voyage from Piraeus to Aqaba with a general cargo including toilets, wash basins, bath tubs, a BMW 320 motor car (apparently belonging to the captain), aluminium, plastic sheeting and several containers of general goods. During a bad storm on April 1st 1981 the ship got caught on one of the southern reef mounts at the tip of the Ras Mohamed peninsula. After 4 days aground she rolled over onto her port side, her bow awash, and with her stern hanging over the abyss. The wreck remained in that position for several years, slowly toppling over until it was totally upside down. Then one day in 1985 the hawse wire holding it snapped and a great wreck was lost as it slid down the reef leaving behind only evidence of its cargo; baths, toilets and a car. Much more famous in its demise than during its sea-faring days, a reef, beach and bay were named after this ship where it sank.